I am fine either way since I am going to the Sunday Matinee. A good lunch before is good, but you have a cutoff time to get to the theatre - unless there is a restaurant in the mall or nearby. Dinner afterward is okay because there are no time factors. Meet the cast afterward and then a nice social "Linner" after that. I favor the latter. Okay, that's fine with me. The theater is in the middle of a huge shopping center, so there are lots of restaurants within walking distance. I won't be able to go with you guys. My cousin is getting married this weekend. If any of the actors come out before or after the show in costume. Can you guys take some photos for me. If they are using the FLCO costumes I would love some pictures of Demeter. If they are still using the old Jellylorum unitard I painted. I'm missing the right side. I do have photos from FCLO of the old Jellylorum costume but, I don't have any really good pictures of the right side. Has anyone seen the show yet? I'm not seeing any reviews. My wife and I have tickets (Sat I think? ), but I'm trying to decide whether or not to offer my seat to a friend of the family. I'm not sure I want to make the drive. But seeing as how this is going to be the last licensed show for awhile, at least while CATS is back on Broadway, I'm not sure I want to miss it. Ah, heck. I might've just talked myself into going. Nobody's seen it yet. It has 5/5 stars on Goldstar with 10 reviews, and the pictures look good so far. Some of the Palos Verdes cast members are in this cast and it's directed by Janet Renslow, so it should be good. VTWC and I will be at the Saturday performance if you want to say hi. We'll be wearing Cats shirts. I'm driving in from OC. Well it's funny, they posted some pictures on Facebook, but they're way too small to see. Other than that, I've only seen pics that the cast have posted on their own Facebook pages. I don't think I should post them here, but if you look up "Broadway at the Gardens- Lewis Family Playhouse" and look at the picture they posted of the cast, their names are tagged. Saw the Saturday night (19th) performance. Loved the venue. Probably the only bad seats in the house were where I was sitting (front section, far left). I couldn't see any of the character action stage right, like Macavity, Rum Tum Tugger, Skimbleshanks or Sillabub on that "balcony" area. But even still, the staging was glorious and I thought the sound was clean. A few technical glitches with mics, but it's probably the first time I've ever heard every word distinctly. Lighting and sets looked great. As did the costuming, actually. Didn't expect that. Some of the wigs were weird, I thought. I was afraid I was going to compare this production less favorably to the SDMT '14 and Norris Theatre '15 shows, both of which I loved. But this was right there with them, I think. I, personally, liked seeing and hearing Debbie Prutsman back in the role of Grizabella. Kirklyn Robinson (Jellylorum/Griddlebone) and Rob Hoyt (Old Deuteronomy) are the other vocal standouts, just as I remembered from Palos Verdes. Also liked the "new" performers in the Mungojerrie, Rumpleteazer and Skimbleshanks roles. I had few quibbles with some of the performances (mainly singing) and there were a couple of technical glitches though not nearly as many as at Palos Verdes. And I thought I preferred a live orchestra over pre-recorded music, but some violin tuning and some less-than-nimble cornet/trumpet playing had me wondering why there was no musical director for this production. Dancing and choreography was really good, if unchanged from Janet Renslow's previous shows. But I was delighted by the show overall and a little sad when it ended, knowing this'll be the last licensed show for awhile now that its returning to Broadway. The Lewis Family Playhouse seems almost perfect for CATS. An idea size and lots of room for the cast to move about and interact. The house rules were confusing and intimidating though. I was told I couldn't take a picture of Coricopat and Tantomile during intermission, but then I saw many others "getting away with it" without objection. I'm looking forward to hearing what you regular, CATS-fanatics thought and hoping you captured and will post some pics. VTWC and I were at the Saturday performance too. We also saw the Sunday performance with Rumplepurr. I've been to the Lewis Theater two other times and both times I thought to myself, "man, this place would be perfect for Cats!" So I was quite ecstatic when I learned that they'd be doing a production. For Saturday, I sat in the front of the back orchestra section, on the right side (near the doors), because I knew I'd get a ton of interaction. And I did! We had Skimbleshanks come up to our section during green eyes and Tantomile recite The Naming of Cats to us. Overall, while I definitely enjoyed the performance, they were not my favorite cast. I don't know why, but they weren't as swift and athletic as the Palos Verdes and San Diego cast, which is odd because those productions were also directed by Janet Renslow. The Palos Verdes production, which is my favorite regional cast, had a ton of back flips and running around and jumping off the stage, etc. This cast lacked that "wow" factor that PV had. I noticed that some of the choreography in Jellicle Songs was changed and parts of the Jellicle Ball were cut out. And do I even need to mention Mr. Mistofelees' number? That was the only major disappointment with this production. I don't understand why they cut that number short. It's an audience favorite, after all. The man playing Mistofelees seemed like a good dancer, so I don't think it had to do with him not being able to perform the whole number. As for the costumes, from what I heard, they decided to pull together the wigs last minute. So it was a weird mix of the FCLO wigs and wigs they bought online. I don't know why they didn't just use the whole FCLO set, which would've made the cast look more uniform. I could instantly tell that they bought those cheap Cats wigs online (http://www.costumeish.com/products/cat- ... 5201589379) and added color to them. Wasn't a fan. I thought that the FCLO wigs and unitards were pretty decent though. VTWC and I both agreed that the makeup, as a whole, wasn't very good either. The thing with Cats makeup (and stage makeup in general) is that it needs to be dark, so that the audience from all the way in the back of the theater can see it clearly. A lot of this cast's makeup wasn't dark enough, so you couldn't really see it from afar. Also, some of the designs were rather amateur, especially Bombalurina's. With all due respect. The stand out performances for me were Mungojerrie and Rumpleteazer, Demeter, Gus, Skimbleshanks, and Munkustrap. I also enjoyed Old Duetronomy, Jellylorum, Macavity, Victoria, and Sillabub, but they were from previous casts, so I won't focus too much on them. The actor playing Mungojerrie was adorable and I loved his British accent. I could tell he was imitating the actor from the video, which was funny. The woman playing Demeter really nailed her body movements and characterizations. I felt like she really understood the character. Skimbleshanks was interesting to watch. I noticed that every time Grizabella was on stage, he looked sad, almost like he was pitying her. I'm not sure if that's typical? Overall, he had a lot of personality and facial expressions. I really like Munkustrap's voice and vocal inflections. As always, I got many laughs out of Growltiger's Last Stand and was moved by Gus the Theater Cat, so kudos to that actor. 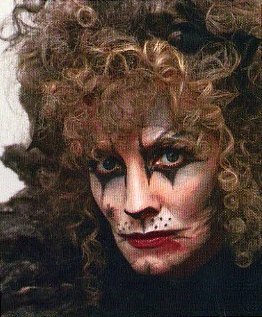 As for Grizabella, while I liked her physicality, it bothered me how she tried to sound like she was crying while she sang. I found it corny. The thing is, "Memory" has been parodied to death in pop culture, so when you sing it like that, it just feels like a parody of the song. The song itself is emotionally heavy, even just the lyrics alone, so you don't need to try to sound sad when you sing it. But, hey, she's still way better than the other woman from Palos Verdes. Didn't care for that performance at all. At least Debbie can belt. I also didn't care for the decision of having her walk into the middle of the Jellicle Ball. That's the biggest dance number in th show, don't interrupt it! Finally, the orchestra was fantastic and the lighting was good. I also agree that the cast enunciated the lyrics very well. Despite my criticisms, I still had a fun time. The cast was very talented and the production values were excellent. So, well done. From a relative newbie's perspective, I like Prutsman's Grizabella and her rendition of Memory. For the record, I liked Gina D'Acciaro too, except for her belt at the key moment of the song, which is sadly what folks will remember. Maybe it's just an aesthetic choice or maybe I don't really appreciate the emotion of the song, but I don't like the slower tempo versions, like that video you posted of Laurie Beechman. It might just be a case of me preferring Elaine Paige from the video and that being my standard and expectation. I disagree with you about the orchestra. Not to be harsh, but speaking as a musician myself, I think it was a poor performance, particularly by the horn. He/she struggled through the notes after Memory and before the "up, up, up to the Heavyside Layer." And I cringed when I heard the out of tune solo strings. Ensemble timing and phrasing was fine, which is what I like better about the live music compared to pre-recorded, but here I think the musicianship from some in the pit was lacking. I didn't notice the lack of energy you did. That Palos Verdes cast did have an acrobat or two, but dang if this Macavity (Matthew Ryan) wasn't a leaper as well. I think having the tumbling behind the ensemble cast during the "Jellicle Song" might have hidden the hand springs from the audience, compared to Palos Verdes where they were leaping and tumbling front and center (and maybe even a little much). I'll say it even though it pains me because I've loved Steven Rada as Mungojerrie in both San Diego and Palos Verdes: this cast's Mungojerrie was every bit as good, or even better. Yeah, he adopted that East London accent of the '98 film, but so did Rada. In fact, I was wondering if Nathan Lightfoot hadn't copied Steven Rada rather than the film. And both Lightfoot and Emma Nossal as Rumpleteazer were captivating. I loved their interplay, their endurance (I detected no loss of breath) and with Lightfoot's size, the two of them did the best double-cartwheel I've seen yet (not counting the film). I felt like this cast came through and interacted with the audience more than the previous two I'd seen, which may be a function of the venue being so conducive for it. I don't particularly like the Growltiger's Last Stand segment, but I did enjoy this production's version. I liked that the comedic timing of James Ellis's Gus/Growltiger was a little different from Palos Verdes. Kirklyn Robinson as Jellylorum/Griddlebone might have camped it up a little more this time, but I love her voice, and I get a kick out of her coddling of old Gus, encouraging the audience to clap. But even though I warmed to the segment, I'd probably like to see the Billy McCaw ballad for a change. See what that's like. I've kept myself from going back and trying to rank/compare the character performances from each of the three past regionals. I think that would be a disservice to the wonderful performances of anyone who I might not consider tops. I'm just amazed how three shows with so many different actors can all have been of such high quality. Maybe its a testament to the talent level in Southern California, but I'd expected a clunker by now. Didn't Musical Theatre West or La Mirada have a production in the past three years too? Was that comparable or even better than San Diego, Palos Verdes or Rancho Cucamonga? I see some clips of other regional shows (and even the touring shows) on YouTube, and these recent three are as good or better. I think SoCal has been very lucky.